Here it is Podcast #4!! This entry was posted in Podcasts, Uncategorized on January 31, 2013 by admin. Happy Monday,sometimes we take ourselves too seriously, so have some fun! Alright, heading downstairs to the dojo for some training now! The other day I bumped into one of my past students who commented that he was on the Old Bujinkandojo.net site and noticed the galleries were taken down. Well here is what you were looking for my friend! Looking forward to seeing you in training once again! Remember, Ukemi should be practiced diligently, every session you can. Last week I had an interesting opportunity to apply various ninjutsu information gathering skills in an investigation I had to direct at my workplace. The lessons I have learned in studying and practicing Choho served me well, and resulted in the termination of an employee for misconduct. In the modern day workplace we need to be extremely careful on the correct phrasing of questions, and corroboration of information from the various sources. Along the way there were opportunities to teach these skills in a “coaching” environment to one of my direct managerial reports. After having gone through 2 interrogation training events (not a pleasant experience, but one that I learned greatly from), it was remarkably easy to pose questions that often opened the door for the individual to spill more information than they realized. Then the sorting and reviewing of the emails and reports that had been sent versus the spoken story was again quite the learning process, but very educational. At the completion of this whole event, as I sat back and reflected I had to say I am glad I train in Ninjutsu both in the physical martial arts sense and of course in the more esoteric portions of our art. ps: Huge updates coming to this site and especially a new members area, stay tuned….. The ability to be able to predict what will happen in a catastrophic/survival situation is an important part of being prepared for all eventualities. This ability to predict what will happen is not some supernatural physic power, but instead lies in your ability to gather and interpret information. In the military world it’s referred to as Intelligence and it has played a critical role in every major combat operation in America since before the Revolutionary War. Like the ninja of ancient Japan, having an intelligence network actively operating covertly (from others as well as from themselves) can be essential for your families survival in turbulent times. Alright, that should get you started on a more balanced approach to information gathering from various news organizations. Remember, you are trying to gain the “Mind and eyes of god”-this is not a religious perception but one that takes in all sources of information, understands where they are biased and then determines his/her on best path from this view point. I hope you enjoyed this short post, more to be coming soon. Remember, the practice of Ninjutsu can prepare you for turbulent times just as it did for the ancient ninja family clans of Japan. 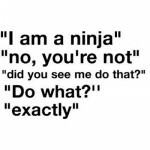 Here is a brand new Ninjutsu Training tip for you to digest and it is what separates martial artists from sports competitors, and it lies at the heart of ninjutsu training. That is Physical Conditioning will help you succeed in a combative, stressful environment. Now it is well known that the best training for an event is the event itself. Example: try and run a marathon if you have never trained for a marathon and then ran a practice event to get you ready for the physical trauma that your body will endure. The same analogy exists in your ninjutsu training, you have to be a part of the event to gain the physical conditioning to participate in the event. For example: when is the last time you climbed a rope? You think hitting the makiwara is preparing you to climb a rope? “Wrong Answer!” Climbing a rope, pull ups, overhead presses, leg exercises and of course rope climbing will prepare you for rope climbing. But not only that it will condition you for grappling not give you tactics to grapple but condition your grip and upper body to pull and lift both physical attributes a good grappler needs. So what about long distance endurance? Running, leaping, carrying a weighted pack over distances, etc all of these physical skills quickly translate out into various aspects of our fighting art. So now go back to your training now review what you do, weights, running etc. and let’s add a few twists to your routine: add running with weights, or run a fartlek, rope climb, hang for time, work on your balance skills etc. When you return to the dojo, watch how your skills translate and how you can begin to handle stressful situations in a much easier fashion. More Ninja Warrior Conditioning articles and videos coming soon! This entry was posted in Uncategorized on January 13, 2013 by admin. Here is part 2 of the Warrior Randomness article and lesson. So as you look at Musashi’s quote, “a warrior should have no favorite weapon” or in this case maybe even technique or tactic. 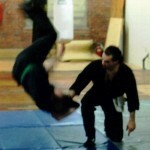 Instead a ninjutsu practitioner should be fluid and adaptable to their environment. Flowing to whatever weapon or strategy that is at hand or necessary to use in order to survive or successfully overcome the obstacles being presented. Again, this sounds so easy! But of course it takes diligent practice and the ability to be, as Bruce Lee was famous for stating in this quote “Empty your mind, be formless, shapeless – like water. Now you put water into a cup, it becomes the cup, you put water into a bottle, it becomes the bottle, you put it in a teapot, it becomes a teapot. Now water can flow or it can crash. Be water my friend.” Just like water! 2) In your next sparring and training session, let go of all of your “favorite” techniques and apply randomness to how you spar and train. If you are a right lead, swap to left lead, if you are a grappler, start hitting etc. OK, now go out and have some fun! This entry was posted in Uncategorized on January 8, 2013 by admin. Back in 2007 I was teaching Leaping(tobi) skills at my old school to various students, when theyasked how high could I jump, I didn’t know but you can see here it was pretty high. This lead me into doing some parkour type training and increased my leaping skills further. This video was on my sister site Bujinkandojo.net. I will follow up with a series of new videos this year so stay tuned. Alright Ninjutsu practitioners, welcome to 2013! Let me just start off this message with a Happy New Year to all of you, and to open a challenge to you for 2013. I started this challenge for myself and after speaking with my students several of them also wanted to join in, so here it is throughout the year leanr and or improve 13 different skills that a Modern Ninja would have in their training. Now don’t make this easy on yourself, take up the challenge and really think about what you will be improving. Here are a few examples: knot and rope skills, learn a second language, orienteering, primitive camping, disguise techniques, surveillance skills, information gathering tactics, and the list goes on and on. Now to top this off, I offered up another personal challenge, there will be 13 different products and site improvements this year!! So to start of 2013 make a list of the 13 skills to work on and set some measurable goals towards each one, and then start taking action towards them! I started on my first one yesterday (increasing cardiovascular endurance) by taking a short 4.2mile run! 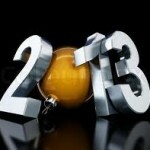 I hope that each of you will take up the 13 in 2013 challenge and make a difference in your training development.